Rarely do we take notes on what we say during what a retreat leader/speaker might say. There is as much guidance in what does not and cannot happen in my life as there is in what can and does – maybe more. Palmer talks about his 2 bouts with depression in this chapter. Many who tried to comfort Palmer were like the comforters in Job. 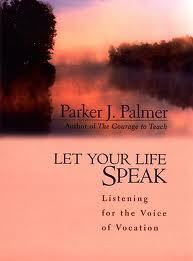 The one helpful person simply was in presence with Palmer. Our spirit can transform the material reality of the world. The metaphors we use for our lives often become our reality.